Inside the Fridge welcomes New Yorker Martha McKittrick! This Registered Dietitian and Certified Diabetes Educator works at a hospital, has a busy private practice and is an avid long distance cyclist. Having worked in a city for the past 25 years, she does her best to eat healthy despite the challenges of city life… AND, better yet, Martha blogs about it, providing practical tips to help New Yorkers and city girls alike, stay energized, healthy, and balanced. Check out her blog at citygirlbites.com! ITF: Where do you shop for food? MM: For me, convenience is a priority. I go to the closest store possible because I‘m usually short on time … and have to carry my groceries home (most New Yorker’s don’t drive!) This usually means my local Food Emporium supermarket 2 blocks away. I also shop at local delis or Asian markets. A new Whole Foods just opened about 10 blocks from my apartment, so hopefully I’ll get there from time to time. ITF: Do you love food shopping or dread it? MM: I’m kind of in the middle. The problem with most NYC grocery stores is that they tend to be really small and don’t stock too many interesting new products. Whenever I get to shop in “suburbia” I’m fascinated by the products found in the massive supermarkets and could stay there for hours! I think I’d love shopping then. ITF: What is the single most important thing on your mind when you are shopping for food? MM: Don’t forget anything because I don’t want to have to go back. I rarely make a list … I just try to remember everything. ITF: How often do you shop? MM: I tend to do a larger grocery shop twice a month. And I do “mini shopping” every night on my way home from work or the gym at my local deli/market to pick up yogurt, etc. 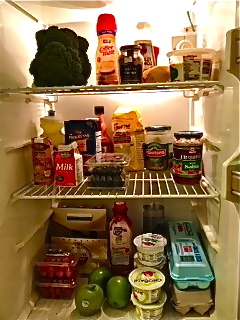 My miniature NYC refrigerator/freezer/cabinets have minimal storage space, hence the frequent shopping! ITF: How many do you shop for? Ages? ITF: What is your weekly food budget? MM: Funny – never really thought about this. I guess I don’t have a formal budget, I just buy what I need. Although I must admit that my daily trips to the Asian Markets must really add up as their prices are significantly higher than what you’d find in a larger grocery store. ITF: How do you plan your weekly meals? Create a spreadsheet of fly by the seat of your pants? ITF: What is the most coveted food in the fridge right now for each member of the household? Why? Greek yogurt hands down. I’m actually obsessed with it. Sometimes I’ll eat 3-4 a day. I love it because it is filling, healthy, great for a quick snack or dessert (it’s just as good as ice cream to me) and is a great pre and post workout snack. For my boyfriend, it’s Haagen-Dazs chocolate sorbet. He eats a pint at a sitting. ITF: What convenience product can you not live without? MM: Hmmm .. not sure that there is really anything I couldn’t live without. But if I had to pick something (OK – this is REALLY bad), I’d say Coffee Mate Fat Free Hazelnut. 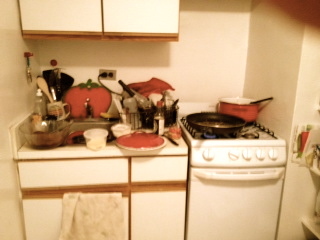 But I want to add in a few more that I rely on: flavored vinegars and mustards and canned tomatoes. ITF: What brands do you swear by? Why? ITF: What cooking utensil/piece of equipment/appliance do you live for? ITF: What are your go-to food/nutrition/culinary/cooking website/s, book or cookbook? MM: I like the Food Network, Epicurious, Cooking Light and Twitter. Actually, I have found some of my favorite recipes on Twitter. ITF: What was the last meal you cooked from scratch? MM: Two nights ago, I made salmon with maple syrup/balsamic vinegar/ dijon mustard glaze, whole wheat couscous with spinach, onions, tomatoes and parmesan cheese. My boyfriend timed me: 27 minutes to make the whole meal! ITF: If one person could cook for you tonight, who would it be? MM: Executive Chef Jeremy Bearman and Pastry Chef James DiStefano from Rouge Tomate. It’s one of my favorite NYC restaurants. The food is healthy, seasonal and delicious. Let’s see how they would deal with my miniature kitchen! ITF: What words of wisdom or advice do you have for other folks who are doing their best every day to fill the fridge? MM: Plan ahead. I find that so many of us are pressed for time these days, it’s important to keep your kitchen (not just fridge) stocked with the basics. Some of the basics that work for me are: good olive oil, flavored vinegars and mustards, salsa, frozen veggies, frozen berries, canned beans, freshly grated parmesan cheese, eggs, hot sauce, and boxes of whole grains. This is a start. If you are really SO busy that you don’t have time to go to the grocery store, try a delivery service. In the NYC area, we have Fresh Direct. ITF: What are you working on these days that you’d like to tell us about? MM: I’m always working on my blog City Girl Bites, whether I’m dissecting pizza to calculate the calories or just providing practical tips to eat healthier. My most recent project is with Canada Pure Maple Syrup. I’m a spokesperson for their new exercise/nutrition campaign called Fit Maple that talks about how maple syrup can be used to fuel athletes. Check out the VIDEO link: http://www.purecanadamaple.com/media-room/ we made at the FitBloggin’ Conference There are also some great recipes on their site!